The typical shape of the SM-l’s dual exhaust nozzles The aircraft was used as a test bed for the AM-5 engine. 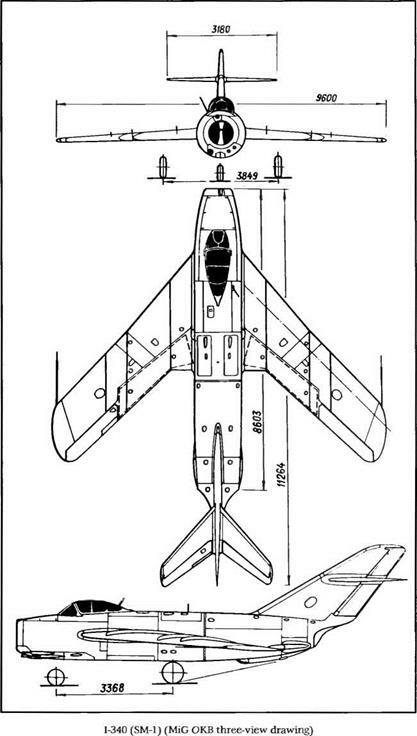 (161-square foot) tail chute was attached to the fuselage under the tail section. 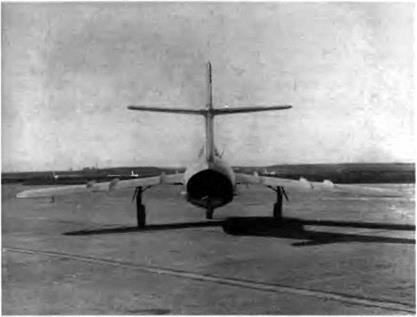 The AM-5F development flights with the SM-1 and later the SM-2 convinced Mikoyan, Mikulin, and other experts that the thrust of this engine was still inadequate for the next generation of Soviet aircraft. Mikulin embarked immediately on the creation of a new afterburner and increased the engine compressor output from 37 to 43.3 kg/sec. Out of this came a much more powerful turbojet, the AM-9, later renamed the RD-9B. The top speed of the compressor’s first stage was already supersonic, and with the afterburner the thrust reached 3,185 daN (3,250 kg st). This was the engine that the MiG OKB counted on for its new supersonic interceptor. Span, 9.628 m (31 ft 7 in); overall length, 11.264 m (36 ft 11.5 in); fuse­lage length, 8.603 m (28 ft 2.7 in); wheel track, 3.849 m (12 ft 7.5 in); wheel base, 3.368 m (11 ft 0.6 in); wing area, 22.6 m2 (243.3 sq ft); empty weight, 3,705 kg (8,166 lb); takeoff weight, 5,210 kg (11,483 lb); wing loading, 230.5 kg/m2 (47.2 lb/sq ft). 15.0 m (49,200 ft) in 6.1 min; service ceiling, 15,600 m (51,170 ft); range, 920 km at 5,000 m (570 mi at 16,400 ft); 1,475 km at 10,000 m (915 mi at 32,800 ft); 1,965 km at 15,000 m (1,220 mi at 49,200 ft); take­off roll, 335 m (1,100 ft); landing roll, 568 m (1,863 ft).